The market’s been shaken recently. And another tremor will ripple through again. But this is an exciting moment. one that’s every investor’s dream: to be there at the beginning. To invest in that industry - that company - that takes the world by storm. And the returns aren’t double or triple or even quadruple. They’re much more than that. Imagine that in May 1997 you took just a small stake in an industry bursting onto the scene - online retail. You bought shares in that quirky little disruptor, the online bookseller Amazon (Nasdaq: AMZN). You paid $1.50 per share. A mere $150 would’ve bought you 100 shares. That’s a gain of more than 96,000%. At this very moment, there’s an industry poised to see growth like Amazon’s and the e-commerce industry’s... nearly 1,300% over the next decade. Even in the next few years, this global market will explode 344% higher. 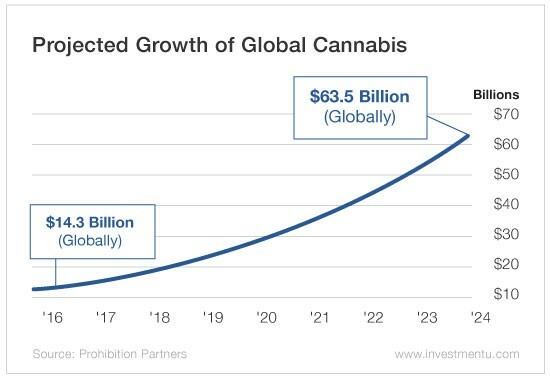 Investors can’t ignore it: Legal marijuana is here... and this is only the beginning. In 2012, Washington became the first state to legalize recreational marijuana. In January 2014, Colorado began recreational sales. In October 2015, Oregon dispensaries launched adult-use sales. In July 2017, recreational marijuana sales began in Nevada. In January 2018, adult-use marijuana sales launched in California. In July of this year, Massachusetts will open recreational pot shops. The same month, Vermont will allow limited recreational legalization as well. In the U.S., medical marijuana is the fourth-fastest-growing industry, just behind cryptocurrencies. By 2020, New Frontier Data estimates the cannabis industry will create more jobs than manufacturing. But investors must remember: The U.S. is just one fragmented piece of a booming global industry. And cannabis is still not legal at the federal level. In North America last year - including Canada - marijuana sales grew 33% to $9.7 billion. By 2021, the North American market will more than double to $24.5 billion. 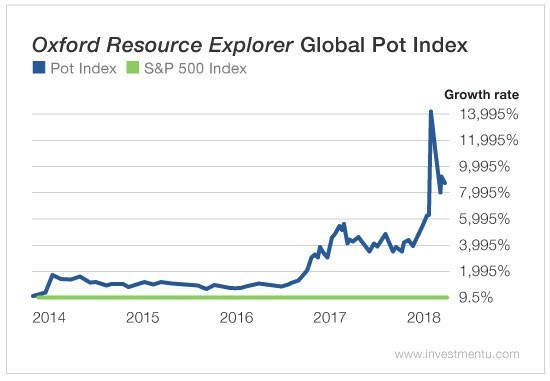 That means that most of the money to be made is outside of the U.S.
And as we see more and more countries legalize medical and recreational cannabis, we’re watching the world’s leading marijuana companies explode higher. The global trade routes are being drawn. On one side, we have exporters... on the other, importers. And there are new countries that want to participate each day. If you’ve ever dreamed of being there at the beginning... of investing at the start of a new, disruptive, lucrative and worldwide industry... this is it. The end of prohibition is here. And we have an investment opportunity before us that comes along only once every couple of decades . Years from now, you won’t be at a cocktail party telling people how little you paid for Amazon shares. You’ll be telling them how early you got in on the world’s most powerful marijuana mega-companies.